Image courtesy of JBG Smith. NEW LISTING IN PREMIER CONDO, CRYSTAL CITY.1605 SF ELEGANT LIVING. BUILDING PROVIDES ALL AMENITIES.UNIT OVERLOOKS OUR NAATION'S CAPITAL...YOU ARE THERE! WALK TO PENTAGON, METRO, MALL. BEST LOCATION. MINUTES TO DC, GEORGETOWN AND CAPITAL. See National Landing Listings below, search nearby neighborhoods, or contact us for a list that fits your needs. National Landing is an area of Northern Virginia, 3 miles outside of Washington, DC that includes the communities of Crystal City and Pentagon City in Arlington and Potomac Yard in Alexandria. Located adjacent to the Pentagon, Reagan National Airport and minutes from DC. Real estate in National Landing consists of high-rise condos in Crystal City and Pentagon City and town homes and mid-rise condos in Potomac Yard. The National Landing neighborhood was designed with walkability in mind. Public outdoor space is found throughout the community - Crystal City Water Park, Longbridge Park offering 30-acres of playing fields, walkways, a rain garden and public art display and the 24-acre Potomac Yard Park with an interactive water fountain, walking trails, picnic areas, playing fields, sports courts, and historic interpretation of the Yards. The Fashion Centre at Pentagon features 170 retailers and restaurants. Amazon has selected the National Landing neighborhood and its 17 million sq ft. of office space for its second headquarters location. This will add as many as 25,000 jobs to the area and billions of dollars in additional investment for the community. National Landing is located directly south of the Pentagon and has long been a location of defense contractors. National Landing offers tremendous access to public transportation with three metro stations on the Blue and Yellow Lines - Pentagon City, Crystal City and Potomac Yard (opening in 2021). The Crystal City Station is expected to add additional metro entrances. The Virginia Railway Express' stop in Crystal City offers rail service between Union Station and Broad Run on the Blue Line and Spotsylvania on the Red Line. The Metroway bus service runs between Pentagon City and the Braddock Road Metro Station. 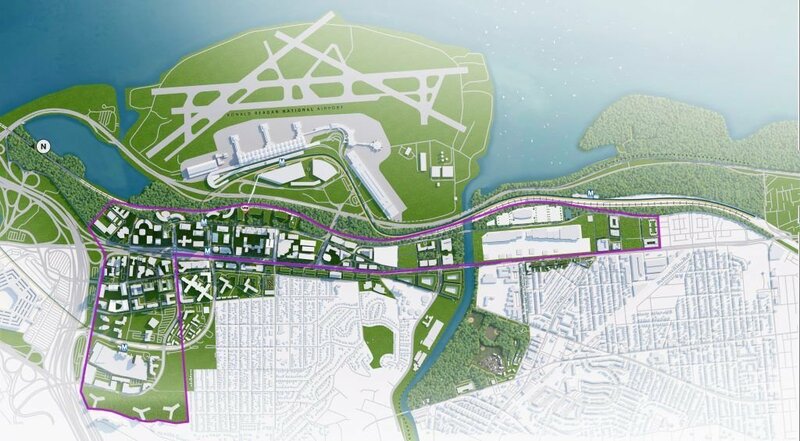 Reagan National Airport is located directly west of National Landing and a high line walkway between Crystal City and the airport is currently under assessment. Driving access to DC is most convenient via the 14th Street Bridge located north of National Landing.